Could I look more proud of myself?! 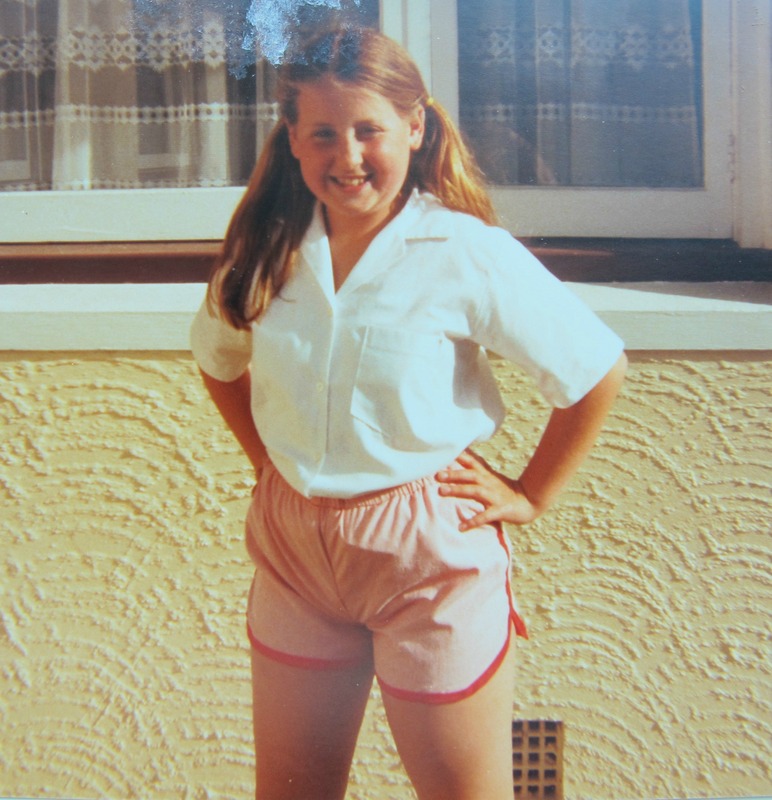 I must be about 10 in this picture and I remember I was supposed to make a skirt but being as stubborn as always, I wanted shorts. Look, I have even used bias binding on all the edges, not bad for a beginner huh? Apart from a tote bag I remember this as my first ever sewing project. < The Shirt has hit the fan! Amazing! I was ten when my mom helped me make a basic elastic waist skirt and matching vest. It was brown cotton with little orange and green apples – so 70’s. She helped with the bias binding. Very clever little you! Great pic! I think my first sewing projects were little teddy bears and purses, handstitched from mums sewing scraps. Teddy bears are complicated – so many small details – go you!! How cute! I wish I would of started sewing at that age. I got sent on a knit course when I was about 10-11 and the fever started then – I was so lucky to have sewing relatives! Awesome work on that bias! Love the shorts. 🙂 I made barbie clothes for years before ever attempting to make something for myself. Then, when I was 14, I made a yellow sundress and reversible jacket to go over it. One side was eyelet and one side was white. I wish I still had it! Or at least a picture of it! I want those shorts now! I think I used to make pillows/pillowcases and blankets for my dolls when I first started sewing! These are awesome! You definitely have a good reason for looking smug. My first project didn’t turn out nearly so well. What a great post! You are totally owning those shorts…! Wow that is some flash sewing for a beginner! Think mine was shorts too and around the same age. They were a demin chambray with cotton lace around the bottom, sounds hideous now! What a brilliant photo, and even more brilliant shorts! 10 year old you was not afraid of a challenge! My first sewing project was a humble shopping bag, and I would have been 11 because it was in my first year a secondary school. Fantastic.. How wonderful that you have a photo of your first garment.. You did a wonderful job..
Oh no! What a shame your first garment was a dud. You certainly have improved though!! I love it! Mine was a costume for a skit when I was 11. I was lettuce, and I really went all out with the embellishments. I am super impressed by your shorts! A lettuce!! LOL – I would love to see a picture of that!! and don’t you love how high I have them pulled up?! Haha, love this picture!! You definitely look very smug. 🙂 My first sewing project was probably a quilt block when I was about the same age as you in this photo… but who knows! Yep smug 🙂 I have never tried quilting to this day – not sure I would know where to start! !